ROCKLAND, Maine -- In the elegant dining room of the Berry Manor Inn, gold brocade curtains with tasseled pullbacks flank floor-to-ceiling windows. Tables are topped with burgundy, sage, and gold plaid linens, fine china, and crystal stemware. Leaded glass corner cabinets showcase precious items from the inn's Victorian heyday: cut glass, jewelry, and an assortment of silver candy boxes. And on the long, gleaming, mahogany sideboard is a display of -- we are not making this up -- toy dancing hamsters. ''It's Mike's contribution," said Cheryl Michaelsen, who bought the inn with her husband, Mike LaPosta, in 1998. ''We try not to take ourselves too seriously here." We wanted to dislike those hamsters -- the pointy-nosed bride adjusting her veil, the wrinkled birthday celebrant wielding a walker. The 40-plus costumed rodents were a visual anomaly in an otherwise magazine-spread-perfect room. But in 48 hours at this midcoast Maine retreat, we reluctantly succumbed to the hypnotic combination of hospitality and zaniness that Michaelsen and LaPosta have crafted. OK, a lot of it had to do with the pies. When we arrived road weary and hungry on a Friday night, Michaelsen gave us a quick tour, showed us to our room, and nonchalantly mentioned that in our guest pantry there were fresh-baked blueberry and cherry pies, and French vanilla ice cream in the freezer. At that point, I don't think my husband would have cared if we even had a bed. But we did have a bed, a comfortable, king-sized one with an ornate carved mahogany headboard and a half-tester canopy in a spacious room in the carriage house, which the innkeepers renovated in 2003. We also had a comfortable chaise lounge by a gas fireplace on a brick hearth, a nightstand, desk and chair, phone, small television, vanity table with stool, and an upholstered chair, providing lots of places to settle in with a book and good lighting for reading. The small closet held terry robes, an iron and ironing board, and extra pillows and blankets. The Victorian decor was elegant but not frilly in shades of burgundy, olive, and beige, with window treatments complementing the fabric-draped bed. The carriage house was once a livery business, and the restoration kept the equine theme with prints of horses on the walls and subtle touches such as a brass horse's head hook on the bathroom door. The hayloft door in our second-floor room was intact, topped by lace-paneled windows and a Roman shade in a rich, chocolate-brown fabric. Mirrors were judiciously hung to make the space look larger and compensate for the limited number of windows. The bathroom featured a two-person shower with extra jets, a corner whirlpool for two, and Caswell-Massey toiletries -- oh, yes, and a copy of ''Flushed with Pride, the Story of Thomas Crapper" (Pavilion Books Limited, 1989) left thoughtfully on the toilet lid. In addition to pies, the guest pantry had a full-sized refrigerator stocked with complimentary bottled water and soda, a coffeemaker, herbal teas, glasses, stemware, plates, cups and saucers, and flatware. There were comfortable chairs from which to watch a large television hidden in a wooden cabinet. We had an intoxicating sense of being in someone else's beautiful home but feeling completely free to help ourselves to anything. The striking gold and burgundy building is in a residential neighborhood of grand old Victorians, an easy walk to the harbor. 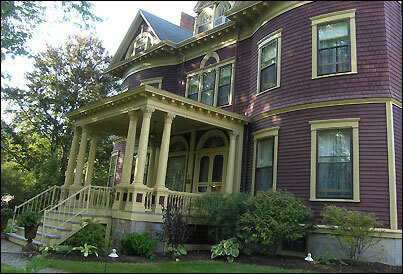 It was built by Rockland business mogul Charles Berry in 1898 as a wedding gift for his wife, Georgie. We were enchanted by the expansive, high-ceilinged common rooms, the upholstered built-in benches in the foyer, and the dozens of old family photographs on the mantel in the living room. Both the main house and the carriage house are on the National Register of Historic Places. Michaelsen said they took great care during renovations to preserve significant architectural features. In a third-floor room in the main house, a portion of the floor is cut away and fitted with glass to reveal the original lead trough that carried rainwater from the gutters to a cistern in the basement; in another room, a window box cut into a wall displays the original wallpaper signed and dated by the paperhanger, and a set of pearl inlay buttons used to call servants. A beautiful carved wooden sign, replicating the letterhead of the Berry Brothers livery company, greets guests in the carriage house. At breakfast, we enjoyed excellent service from personable staff, including Cheryl's mother, who is also one of the pie bakers (the other is Mike's mother). We started with a poached pear with a dollop of cinnamon-spiked yogurt, followed by baked eggs with tomato and basil, bacon, and home fries. On Sunday, we were treated to cranberry-stuffed French toast with an apricot topping. A homemade breakfast bread is always on the menu. Elizabeth and Dave DeGaust of Port St. Lucie, Fla., were making their fourth visit, putting a night at the inn on both sides of a windjammer cruise. ''We come here, get pampered, rough it for a few days, then come back and get pampered again," Dave said. The dancing hamsters, Elizabeth added, ''are just too funny."